The introduction of a new line for the watches made every year is definitely what grants big success Mercury go through and the brand will keep on moving with this mind. This particularly focus is derived of a combination of leading-edge Swiss technology and precision engineering with dedicated functionality – Mercury watches are designed to be fit for purpose, no matter what the conditions. In fact, every watch is the result of more than six months’ engineering and takes at least five months to manufacture – partly because the watch cases and the attachments between bezels and straps are crafted to ensure durability and strength. 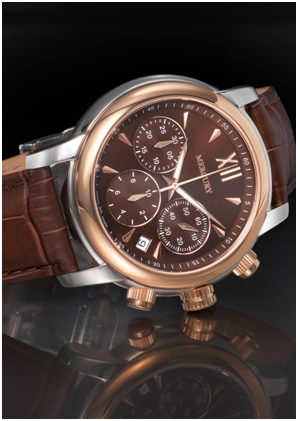 As you’d expect, all cases are made of stainless steel and feature chronographs. That said, a look at the collections confirms their appeal to those simply looking for an active aesthetic, too. While every Mercury watch looks reassuringly strong and durable, that’s no barrier to a wide range of styles. Many come with a choice of straps – metal, leather or rubber – and all with a choice of a silver, gold, rose-gold or black finish. The new models that have been presented this year at Baselworld will shine as never before with exclusive design based on elegance, classic design, and soft look. Last year, the brand has made a big push made by presenting its new line leaded by the model: NOBLE. There was a gent and a ladies line. The brand also introduced diamond set watches on the two lines that permit to the watches to shine as they deserve and to position the brand to the place it belongs : « IN TOP LUXURY WATCHES MARKET. » Moreover, even it’s a young brand, it has keep some tradition that may not change with the gent line that keep featuring chronograph swiss movements on all it’s gent size. Some models remain undeniably chic, the detailed design of others belies their functionality – as is neatly illustrated by two of the brand’s models. While the NOBLE is a classic sports chronograph design – featuring a contrasting matt and polished stainless-steel strap – the NOBLE is a highly styled watch to wear, sporting a leather strap, a sunray dial with contrasting silver bezel and subdials. Wasfi Taher, the man behind parent company Riba Watch, is involved in every stage of production at his Le Locle-based workshop, itself responsible for manufacturing watches for five separate brands – Faros, Geovani, Mercury, Murex and Optima. Mercury was the third brand to come out of the Riba Watch stable. The watches were designed solely for men until recently, but the brand has now added women’s models – and showed them at BASELWORLD last year and will keep adding new lady’s models this year by showing them at baselworld 2017.